OKLAHOMA CITY -- Oklahoma's move to stay all executions until the spring of 2016 drew praise from the executive director the American Civil Liberties Union of Oklahoma Friday. The comment came after The Frontier, an on-line new site based in Tulsa, published a story Friday that stated Oklahoma wouldn't be conducting any executions until 2016. The story, citing federal court records, said "a court filing in the Western District of Oklahoma Federal Court states that in the interests of 'judicial economy and comity,' the attorney general will not seek an execution date for any of the condemned prisoners until their attorneys are provided with the results of an ongoing state investigation and any changes made to the protocol as a result." ACLU of Oklahoma executive director Ryan Kiesel said he was pleased by the delay. 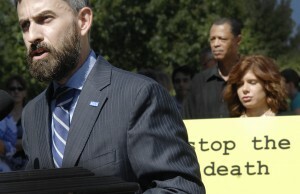 ACLU Executive Director Ryan Kiesel speaks during a rally to stop the death penalty. "We applaud the news that executions are on hold in Oklahoma until the Spring of 2016," Kiesel said. "For the next few months at least, we can be grateful that the state has put away its instruments of death." However, Kiesel said the organization finds it "extremely difficult to imagine that during the next few months the state will be able to demonstrate that it should be trusted with the most awesome power a people can cede to its government." "That becomes increasingly less likely with the continued insistence on secrecy and resistance to independent oversight," he said. "We hope during this sobriety from state sponsored murder the people of Oklahoma and their elected representatives will seize the opportunity to reflect on the unavoidable failure of any system capital punishment."